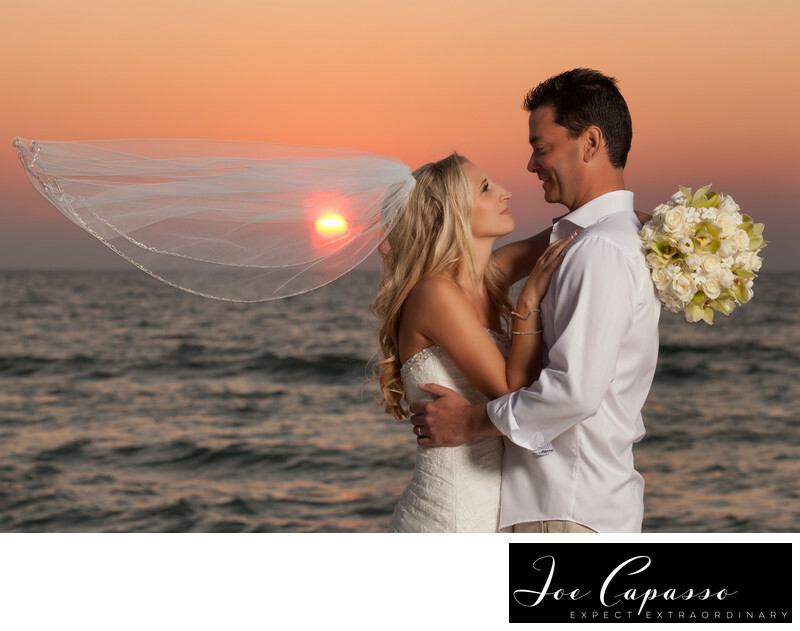 Jessica and Michael were married at the LaPlaya Beach and Golf Resort. Their ceremony was held on the lawn in the back of the hotel facing the beautiful Gulf of Mexico. What's great about having a ceremony on the lawn at Laplaya is not having to worry about getting sand in your shoes, while still having a beautiful view of the beach! Of course, if you're having a destination wedding from elsewhere in the country, maybe that's your thing! After the couple's lawn ceremony at LaPlaya we headed down to the beach where we snagged this awesome sunset photo of the couple. Thanks to a cool breeze off of the Gulf of Mexico we were able to capture this dramatic photograph of Jessica's wedding veil blowing in the wind with the sunset behind her. Next we walked around the rest of the Laplaya Beach and Golf Resort's property for more dramatic photos. You may find some more if you browse through our wedding gallery on the website! Keywords: laplaya (21), laplaya beach and golf resort (24), LaPlaya Wedding (12), naples beach wedding (3), naples wedding photographer (45), naples wedding photographers (3).